This lovely refreshing wine was introduced by our founder, Andrew Colaruotolo, in 1981. 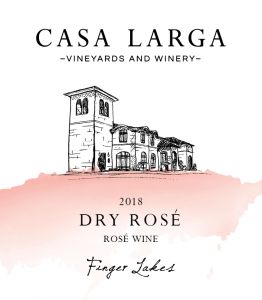 It was his first rosé, created in reminiscence of the wines of the family’s original vineyard in Gaeta, Italy. Viticulture notes: DeChaunac is a rare red French-American grape variety developed in France by Albert Seibel in the 1860s. Casa Larga founder, Andrew Colaruotolo, planted several rows of DeChaunac in the late 1970s. Among red wine grapes, DeChaunac is relatively cold hardy, resistant to mildew, vigorous, and early budding and ripening. It produces inky juice that is low in tannins, with earthy aromas and stone fruit notes. Winemaking notes: DeChaunac grapes designated for Rosé production are picked early to maintain crispness and acidity. They are then whole-berry pressed without crushing to control color and tannin extraction. Fermentation occurs at a very low temperature in stainless steel tanks much like a white wine. The wine is then bottled young to preserve its fresh, vibrant, fruit flavors. Aging: Store at a cool temperature (55º-60ºF) and out of direct sunlight. This wine is produced to be drunk young, crisp and fresh, i.e. within 2 years of bottling. Tasting notes: This Dry Rosé features delicate cherry and tart apple notes and enjoyed all year round. Pairing suggestions: Fried fish, roasted beets with goat cheese, salmon with aioli, lightly seared tuna, rosemary flatbread with blue cheese and honey, grilled sausage or chicken, paella, and olive appetizers.